It took almost 500 years for one of the bad boys of Renaissance art to get a major retrospective. 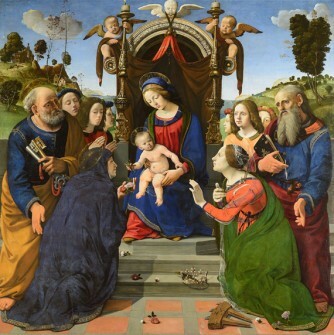 But if recent crowds at the National Gallery of Art are any indication, Piero di Cosimo may be starting to emerge from the shadows cast by famous contemporaries such as Botticelli, Leonardo da Vinci and Michelangelo to take a long overdue star turn. 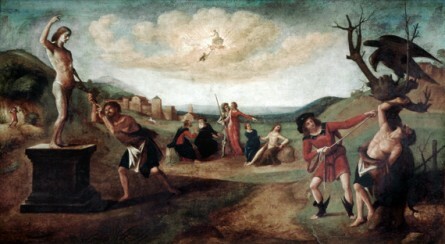 “Piero di Cosimo: The Poetry of Painting in Renaissance Florence,” features 44 altarpieces, portraits and mythological and allegorical scenes painted by an enigmatic figure who was described in his day as uncivilized, eccentric and prone to “building castles in the air.” Piero (1462-1522) lived in squalor, largely limiting his diet to eggs, which he cooked dozens at a time with the glue he used in his work. He ranted at everyday sounds like ringing bells and crying infants, according to Giorgio Vasari’s “Lives of the Most Excellent Painters, Sculptors, and Architects,” a somewhat unreliable but essential chronicle of the Florentine masters. While he may have been an odd duck, Piero managed to get commissions from prosperous bankers and merchants who flourished under the Medicis in the cradle of the Renaissance. About 60 known works survive. Spread through six rooms in the National Gallery’s West Building, the exhibit is the first devoted to the artist since a 1938 show in a New York gallery that featured seven of his paintings. It’s also the first collaboration between the National Gallery and the Uffizi Gallery in Florence, Italy, which will mount a version of the U.S. show after it closes on May 3. Though Piero had a penchant for inserting satyrs, monsters and obscure gods into theatrical scenes, he also painted sensitive portraits and landscapes with stunning colors and expressive characters that pointed the way toward Mannerism. “No artist has given the world more rare and singular inventions while remaining in the shadow of the Renaissance greats of his time,” said Cristina Acidini, superintendent of cultural heritage for the city and the museums of Florence. Vasari wrote that Piero, despite his uncouth ways, gained recognition in part by arranging elaborate spectacles for the Florentine Carnival. One has a chariot of death drawn by buffaloes that featured skeletons, white crosses and the figure of death. The vehicle would stop for the chanting of dirges, at which point skeletal figures would emerge, at once delighting and frightening the crowds. The exhibit includes examples of all of the genres in which the artist worked, offering a unique visual chronology of his life. Such an accounting shouldn’t be taken for granted: He didn’t sign or date his works, and a scarcity of documentation prevented historians from firmly establishing his birth year until 2000, curators said. One of the show’s big draws is the 1493 “Madonna and Child Enthroned with Saints Elizabeth of Hungary, Catherine of Alexandria, Peter and John the Evangelist with Angels” from the Museo degli Innocenti in Florence. The work’s extravagant colors, detailed background and vivid garments rendered in oil and tempera offer an out-of-the-ordinary take on one of the most familiar religious subjects in western art. Piero also excelled at round devotional paintings known as tondo, which he accentuated with curving lines and other elements that sync the image with the frame. Intended for domestic settings, away from the church, the format gave the artist more freedom in storytelling. But it is Piero’s over-the-top landscapes that really rivet the eye. “The Hunt” and “The Return From the Hunt,” both from the Metropolitan Museum of Art, fed Florentines’ love of animal battles with primordial scenes of humans hunting with their bare hands and clubs, then bringing the kill home accompanied by satyrs and centaurs. The inspiration for the pair of paintings is thought to be the ancient Roman poet-philosopher Lucretius, who wrote that wordly happenings stem from natural, not divine, causes. “The Theft of Fire and the Punishment of Prometheus,” a 1510 oil from the Musée des Beaux-Arts, Strasbourg, France, depicts the mythological figure who stole flames from Olympus bound to a tree for eternity while an eagle pecks at his liver. “The Discovery of Honey,” from the Worcester Art Museum in Massachusetts, portrays satyrs banging utensils to attract bees to a hollow tree while an odd assortment of revelers party on around them. The scene is derived from the poet Ovid’s writings about the genesis of Roman holidays. A storm brewing in the background hints at the power and unpredictability of nature. The spirit of creation is celebrated in “Construction of a Palace” from the Ringling Museum of Art in Sarasota, Fla., a frenetic scene with workers clad both in antique tunics and 15th century costumes arrayed in front of a nearly complete building. Curators say the work conflates the Renaissance “present” with the classical past and has been connected to such subjects as the history of primitive man and the construction of King Solomon’s temple. Captivating and enigmatic, it shows the artist’s quixotic fascination with vanished worlds, and his capacity for fantastic inventions. “Piero di Cosimo: The Poetry of Painting in Renaissance Florence” runs through May 3 at the National Gallery of Art, between Third and Ninth streets at Constitution Avenue Northwest. Hours are Monday through Saturday from 10 a.m. to 5 p.m. and Sundays from 11 a.m. to 6 p.m. Admission is free. The 114th: CQ Roll Call&apos;s Guide to the New Congress Get breaking news alerts and more from Roll Call in your inbox or on your iPhone.